Tours depart at 15.00 Tuesday to Saturday from March to October, with a morning tour each Thursday (April to October) at 10.15. From November to March tours depart at 15.00 on Tuesdays, Thursdays, and Saturdays. We are comparing Picasso Museum Barcelona Tour Prices from leading ticket suppliers and Try to find you Cheap tickets prices on the market. Bohemian Barcelona is waiting to be discovered and the Picasso Museum Experience is certain to draw you into the world of radical artists and revolutionary art works. On this walking tour you will become acquainted with the usual haunts of Pablo Picasso in his youth, visit the Llotja Mar Art School, where Picasso studied and developed his use of brushes and paints, stop by El Quatre Gats, the same café where the 20th century artist gathered with his companions, and stroll to the Architects Association building where you can find Picassos one and only art pieces dedicated to the public. The first hour of the Picasso Experience will be spent visiting locations in Barcelona which significantly impacted the life and career of Pablo Picasso. Throughout the tour your knowledgeable guide will fill you in on the importance of Picasso's work on the development of art and the life of the artist himself. 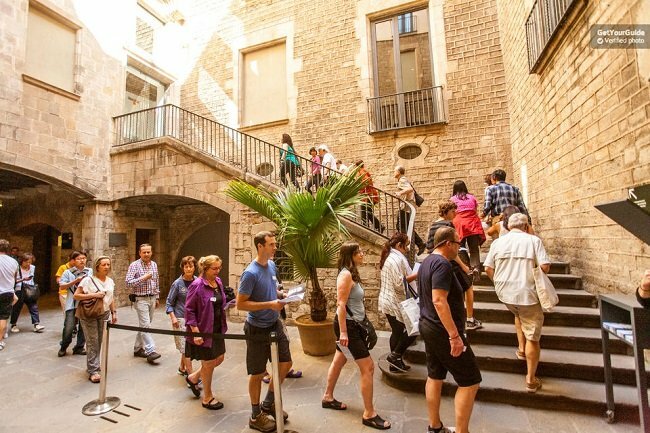 The second half of the tour will take you inside the Picasso Museum, skip the line at the entrance and continue on your guided tour though the museum. Inside you can find some of his greatest works including interpretations of Las Meninas by Velazquez, as well as a progression of Picasso's art works, from his early years to the development of Cubism. A range of stone sculptures and ceramic works are also on display. This tour is aimed at art lovers and historians, it offers the unique opportunity, not just to see the works of Picasso, but to explore the city in which he learnt his skill. This tour not suitable for suitable for wheelchair users or those with walking difficulties. Your Experience With Picasso Museum Barcelona Tour? Walk in the shadow of the renowned Spanish painter, Pablo Picasso, from the neighbourhood in which he lived, to art school where he perfected his talent. Take a guided tour of the Picasso Museum. Learn about his work and his inspirations from an expert guide. Visit the Architects association building to see Picasso's solitary public art. What Picasso Museum Barcelona Tour Includes? Skip the line entry to the Picasso Museum with guided tour. Qualified English speaking tour guide. Travelers Reviews about Picasso Museum Barcelona Tour? This tour has been described as ‘informative', ‘interesting' and ‘perfect'. Meanwhile comments say that the city guides are excellent. The tour has an average 4.5-star rating on Get Your Guide. Travellers have rated the tour as a 4.5-star experience on TripAdvisor and Viator. Please bring a printed version of your voucher. Tickets may be refundable up to 24 hours prior to the scheduled tour, however cancellation fees may be charged for cancellations made less than 7 days in advance. Specific details can be found on the tour suppliers page. Comfortable shoes are recommended, there will be moderate walking during the tour. The Picasso Museum Experience may not be available on the 1st and 6th of January, the 6th, 8th, 25th, and 26th of December, the 1st of May, and the 11th of September. There is no age limit to join this tour. This tour is also available in French on certain days. Precise details of where to meet your tour guide will be included in the booking confirmation. This tour will end at the Picasso Museum.